Now that the White House and Congress have reached an agreement to end the government shutdown and raise the debt ceiling, much attention is being focused on the group that was a key player in the standoff: conservative Republicans and those aligned with the Tea Party. Who are those representatives? 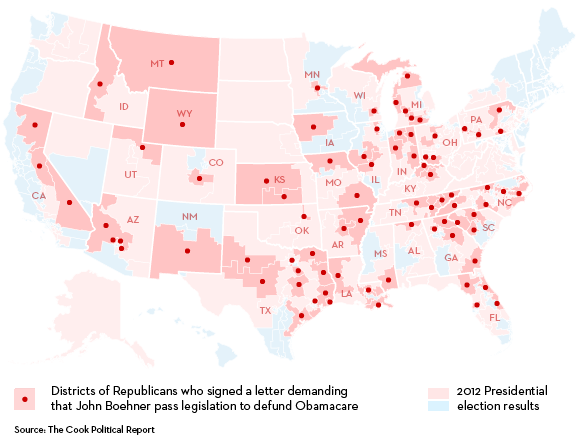 There’s no formal roster, but this map, produced by The New Yorker using data from the Cook Political Report, highlights the districts of the 80 House members who signed a letter to House Speaker John Boehner and Majority Leader Eric Cantor in August urging that the health-reform law be defunded as part of any appropriations bill. Just over half (41) of the signers are from the South; 22 are from the Midwest, and 13 are from the West; the only members from the Northeast are four representatives from rural parts of Pennsylvania. According to The New Yorker’s analysis, the average signer’s district is 75% white, compared with 63% for the average House district; Hispanics average 9% of the population in signers’ districts, compared with 17% overall. All represent districts carried by Mitt Romney last year. A Pew Research Center survey conducted last week found differing views among the public over what the Tea Party represents. Overall, 47% of the public says they think of the Tea Party movement as separate and independent from the Republican Party, while somewhat fewer (38%) say it is a part of the Republican Party. 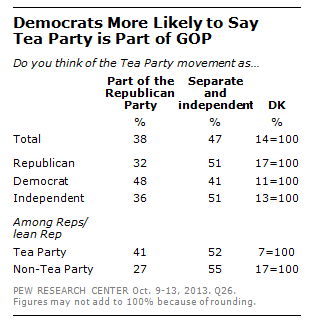 More Republicans view the Tea Party as a separate movement from the GOP (51%) than as part of the Republican Party (32%). Opinion is nearly identical among independents (51% separate, 36% part of GOP). By contrast, Democrats are about as likely to say the Tea Party is part of the Republican Party as to say it is separate (48%-41%). Republicans who agree with the Tea Party see the movement as separate and independent from the GOP, by a 52% to 41% margin.